What kind of person do you need to be to earn the title of Top Co-op Student of the Year? Just ask Dalhousie’s highest-achieving co-op students of 2018 and they will tell you. Ambitious. Positive. Proactive. Driven. Hard-working. Resilient. This diverse group of undergraduate and graduate-level students is defined by their incredible ability to apply their academic strengths to their co-op job while pushing their skill sets to new heights, delivering the greatest possible outcomes for their employer. Having already earned the respect and praise of their colleagues and supervisors, the top co-op students from each Dal faculty currently offering a co-op program will be formally recognized this week at the third-annual Dalhousie Top Co-op Awards. The ceremony, which also celebrates the best co-op supervisors and hiring organizations, affirms the importance of work-integrated learning to enhancing the student experience, preparing graduates to transition into the workforce, and help grow the economy and stimulate youth employment both locally and nationally. It is no coincidence, then, that the Awards (jointly led by Architecture and Planning Co-op, Management Career Services, and Science Information Technology and Engineering Co-op Education) are held during National Co-op and Work-Integrated Learning Week. In 2018 alone, over 2040 work terms were completed by Dalhousie students, representing a five-year growth, and as of the academic year ending 2017/18, Dalhousie demonstrated a five-year growth in work terms with 23 per cent of students participating in work-integrated learning, and a three percent annual growth in co-op work terms over the year prior — a trend that all involved hope to see continue. Get to know our Bachelor of Computer Science winner Amelia Stead. Fourth-year computer science student Amelia Stead has found herself in an enviable position during this final term of her undergrad. With three co-op work terms and nearly all the required Computer Science undergrad courses behind her, Amelia now has her eyes focused on the finish line. Once her studies wrap-up this spring, she’ll be joining her most recent co-op employer, software firm Analyze Re, on a full-time basis. But in the meantime, she’s enjoying the short-term opportunity to discover life outside of computer science and co-op. 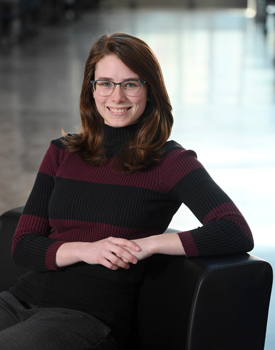 The co-op program was a big part of what brought Amelia to Dal in the first place, but it was through her co-op experiences where she discovered the areas of Computer Science that were the best fit for her. After she finished her first work term with Halifax-based firm QRA, Amelia discovered that she thrived within a small company setting. Knowing this, it was her mentor who suggested she explore Analyze Re as a potential co-op employer. And even though the company wasn’t seeking a co-op student at the time, that small detail didn’t deter her. With a little research, Amelia sent a message to an employee she found on LinkedIn, which led to meeting with the team, and ultimately, a job offer. Things went so well, too, that her term was later extended to eight-months, allowing her the opportunity to work on both sides of the company’s business and to get a better sense of different career paths. As spring convocation looms ahead, having a job offer in-hand is a big relief for the soon-to-be-graduate, who is looking forward to holding down a role for more than four months at a time. Now looking back, Amelia shares that she owes her certainty in career path direction to co-op and describes her co-op experience as an opportunity of growth: “Co-op challenged me. It was a challenging experience, but in a good way! It pushed me ... and made me grow." Read the full story and learn about all the other deserving award winners.